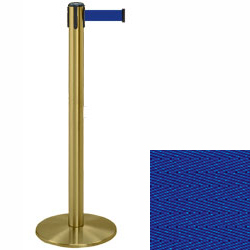 These brass stanchions with blue belt are ideal for creating lines, directing crowds and blocking off areas with their boldy colored strap. Each post has a sturdy weighted base that measures 13.5" in diameter for extra stability in high traffic areas like bars and hotels. 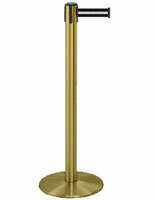 The brass stanchions stand 38" tall and their nylon band is 2" wide and 7.5' long. This type of post for banks and bars is made of durable metal with a satin finish that is easy to see from a distance. The stanchions with a weighted base are also available in a number of other colors, as are their straps. If you would like assistance, click to learn about designing crowd control systems, this will assist you with various layout options.